"Third-person action game that takes place in New York, from creators of Hitman 2." IO Interactive, famous for its Hitman series of video games, brings us a game full of action: Freedom Fighters. The plot takes place in New York City. The Russians won the cold war and conquered the whole world, it is an alternative future ;). You are one of the main characters of the game and your aim is to create a group of "Freedom fighters" to stop the Soviet forces that have the city under control since the Cold War. Your player will gain points for Charisma by doing various deeds in the game. These deeds include capturing bases and destroying enemy supplies. The more Charisma points that you have, the larger your squad is able to be. You can eventually recruit up to a maximum of squad teammates. The player is able to guide the squad by telling them to follow him, attack the enemy, or to defend themselves and the squad. 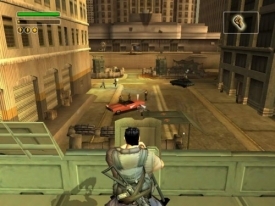 You can also use any kind of vehicle and various objects to remain in control of the area that you are in and eliminate the Soviet forces throughout New York City. The game also has a multiplayer mode that revolves around capturing flags and bunkers within the map that you are i with other players online. This is team gameplay, and you must aid your team to victory. You are also able to play the game with four other players through a local network. This demo allows you to play the police station mission to try out the game. Like most demos, you are limited to just that mission to try out the game before you decide to buy the game.